The indispensable sage, fierce enemy, silent sidekick: the role of Native Americans in film has been largely confined to identities defined by the ‘white’ perspective. Many studies have analysed these simplistic stereotypes of Native American cultures in film, but few have looked beyond the Hollywood Western for further examples. 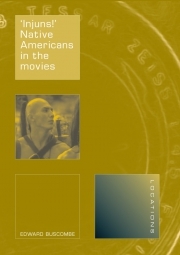 In this incisive study, distinguished film scholar Edward Buscombe examines cinematic depictions of Native Americans from a global perspective. Buscombe opens with a historical survey of nineteenth-century visual culture – from dime novels to Wild West shows on stage. He explains how, in the early years of film-making, many Westerns were sympathetic to Native Americans. Yet, by the 1920s, if Native Americans appeared on screen at all they were invariably hostile. Questioning the implicit assumptions of prevailing critiques, Buscombe looks abroad to reveal a distinctly different portrait of Native Americans. He focuses on the lesser-known Westerns made in Germany – such as East Germany’s Indianerfilme, in which Native Americans were Third World freedom fighters battling against Yankee imperialists. These alternative portrayals of Native Americans offer a vastly different view of their cultural position in American society. ‘Injuns!’ is an original, cogent account of the cultural images of Native Americans through history and around the globe, revealing new and complex issues in our understanding of how indigenous peoples have been represented in mass culture. Edward Buscombe was formerly Head of Publishing at the British Film Institute, has written extensively on the Western, including books on John Ford's Stagecoach (1992) and The Searchers (2000), and has edited The BFI Companion to the Western (1988).